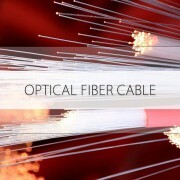 An optical fiber cable is a cable containing one or more optical fibers that are used to carry light. The optical fiber elements are typically individually coated with plastic layers and contained in a protective tube suitable for the environment where the cable will be deployed. Different types of cable are used for different applications, for example long distance telecommunication, or providing a high-speed data connection between different parts of a building. Optical fiber consists of a core and a cladding layer, selected for total internal reflection due to the difference in the refractive index between the two. In practical fibers, the cladding is usually coated with a layer of acrylate polymer or polyimide. This coating protects the fiber from damage but does not contribute to its optical waveguide properties. Individual coated fibers (or fibers formed into ribbons or bundles) then have a tough resin bufferlayer and/or core tube(s) extruded around them to form the cable core. Several layers of protective sheathing, depending on the application, are added to form the cable. Rigid fiber assemblies sometimes put light-absorbing (“dark”) glass between the fibers, to prevent light that leaks out of one fiber from entering another. This reduces cross-talk between the fibers, or reduces flare in fiber bundle imaging applications. All four connectors have white caps covering the ferrules. For indoor applications, the jacketed fiber is generally enclosed, with a bundle of flexible fibrous polymer strength members like aramid (e.g. Twaron or Kevlar), in a lightweight plastic cover to form a simple cable. Each end of the cable may be terminated with a specialized optical fiber connector to allow it to be easily connected and disconnected from transmitting and receiving equipment.